A military ring is your ultimate, unmatched reminder of what you have been engaged in, and of the bright hope promised by days to come... 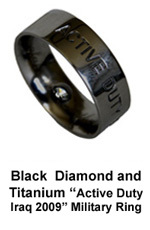 Welcome to our unique line of military rings: our exclusive Active Duty military ring in our proprietary Black Titanium, complete with the name of theater and year of active duty service. 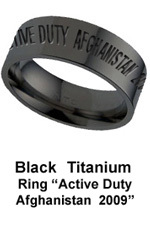 Available exclusively from us, in our proprietary Black Titanium are the original "Active Duty Iraq" and "Active Duty Afghanistan" military rings, complete with the engraved year of service. The rings are fully compatible with night-stealth requirement, completely black, exhibiting combat conditionsA military ring is your ultimate, unmatched reminder of what you have been engaged in, and of the bright hope promised by days to come... 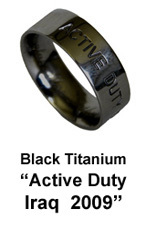 Welcome to our unique line of military rings: our exclusive Active Duty military ring in our proprietary Black Titanium, complete with the name of theater and year of active duty service. strength--it will never bend in action--and low wear. These unique military rings, a symbol of active duty in Iraq and/or Afghanistan will stay with you a lifetime, telling and reminding. 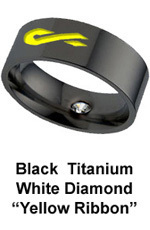 Use it as a symbol, memorabilia, a statement, your wedding band, your spouse's wedding band or both yours. 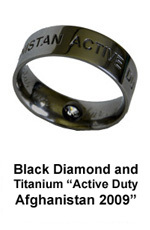 Or--buy it as a special gift for your loved one in active duty. 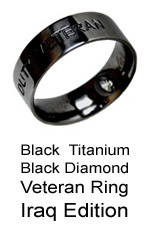 The "Black Diamond - Black Titanium Military Active Duty Rings" version is rendered yet more precious by a black diamond "hidden" on its interior, to avoid exposure, damage and flaunting, yours as a reminder of a precious one, and marked on the exterior by a indented dot. 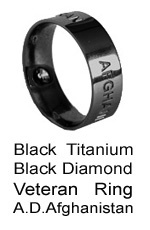 To guaranty the veritable meaning of those rings and the eligibility of the recipient, they are sent exclusively to APO, CFPO and other ISAF member Army Postal Service addresses in Iraq and Afghanistan, and use the actual, active duty year of service in their inscription. 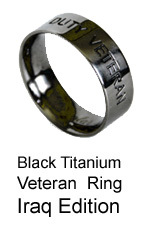 Veterans of active duty in either country may have their rings too. In those, the word "Veteran" replaced the year reference (proof of past service in theater in question may be required). Additional or alternative wording and/or insignia indicating your armed forces' arm, unit etc.- welcome. Extra charges may apply. Available only in our proprietary Black Titanium, with optional glaze inlay. Beware of imitations using other black metals and black plating. But wait! For the dear ones back home we offer the Black Titanium "Yellow Ribbon" band engraved with the yellow ribbon shape and glazed in yellow. Our proprietary Black Titanium line offers genuine Black Titanium products that are hypo-allergenic and employ no PVD application or any external coating, plating painting, spraying etc. Order today your Active Duty Military Ring and refer a friend to order his/her Military Ring, and you will benefit from a $25 bonus. Spread the word about our unique line of military rings. 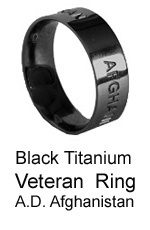 A custom military ring in our Black Titanium is welcome.